Working on a Height adjustable standing desk is becoming more popular and worthy nowadays. No matter whether you are working in your office or at your home, if you have a lot of typing or computer or laptop work then a sit stand desk can become one of your favorite products to use in routine life. This is the world of inventions and smart discoveries and scientists do their best to provide the best tools and gadgets that make people’s lives better and easier. Working from home like freelancing, website developing and much other pc work is the trend that also demands for prolonged sitting and concentration. Many survey and studies have been proved that sitting for excess time can be harmful to our health and a whole day sitter can briefly tell you about the pros and cons of a long time sitting, especially sitting on an ordinary desk that is not even suitable according to your height and physic. If you are using the same old and shabby chair and desk for your personal stuff and also thinking about to change the whole then this article is fully dedicated to you. A 10 minutes reading of this article can bring a positive change into your personal life as well as official life too. So, here we are going to introduce you some smart standing adjustable desk and how to build them. Now it’s time to become smart and advanced, gone are the days of those ugly, uncomfortable desks that only gives you back pain, cramps and headache etc. Now we are promoting the height adjustable deskthat is specially designed to change your hectic life. It encourages your productivity and helps to change the sedentary lifestyle without investing much; you will feel great all day for sure. If you want to build a standing desk then you must need some prior parts before building it. Properly check the quality of the product that you need to build because the base structure and proper foundation is important for building any product. The quality must be highly rated and sturdy so that you can able to build a sturdy desk as well. The desktop and a stand-up desk are one of the significant parts of any sitting and standing desk, so assure that the desk is quite cozy and comfortable. Each person has a different choice and different taste so choose the design according to your desire. A smart and good standing desk has a good feature of adjustment according to your height. So make sure that you are clicking on the right one. As we said before that a stand up desk must be strong enough that has the capability to handle all of your personal stuff and expensive gadgets. So stability is also an important feature. The Internet has done a miracle to the world and any product that you really want can be available at your doorstep but wait for a while. Though there is plethora of thousands of websites that will easily fulfill your requirements still you need to be careful because many of them are the hoax. So research carefully and choose the right brand for you. Autonomous can be the finest option for choosing several adjustable standing desks and standing desk building kits. Hiring someone for assembling or installing the adjustable standing desk which you have ordered online is a common thing but why pay extra bucks, when you can do the whole process by yourself. Assembling the sit-stand is not as hard as you are thinking, it is not a rocket science, you just need to gather all the necessary parts and combine them step by step. Once you need to read all the instructions carefully that’s it. There are plenty of standing desks and adjustable standing desks. Sometimes the assembling remains the same requirements but sometimes they are different, but almost all the steps are the same. First of all collect all the required parts and tools that are necessary for building a Height adjustable standing desk. Important parts like a wooden frame, pipes, desktop etc. if you are looking for a genuine and branded material then choose the right place that can provide you all the specific parts and tools. You must have an idea about the desktop dimension; they are available in different sizes. If you have a lot of stuff to keep on the top of the standing desk then choose the large one otherwise choose the small one. All the parts to building a sit stand desk are available online. If you want to create a stylish and royal looking adjustable standing desk then choose all the parts according to it as well as the color also matters. You can also buy the whole kit that will help you to build a standing desk. First of all, assemble the standing table lifting frame that will help to lift the desktop up. Assemble all the parts according to the given instructions and step by step joint all the screws and tight them, the whole process will take only 10 to 15 minutes if you are doing rightly. Now it is the time to check your hard work, take the remote control and test whether the adjustable frame is working properly or not. That process will take little time and this is only the process that will demand your concentration. So pay your attention properly and read the instructions. Once you have tested the adjustable frame then sign-up for the next process. Once you assemble the adjustable frame and motor electronic system then you should attach the desktop and the sliding legs with the stand up desk. For that, read the instructions first or simply adjust the legs height as you want to keep then joint the legs with the help of screws and tight properly so that standing desk can stand perfectly. Now install the desktop with the adjustable frame and make sure that the top must be in straight position, hold it well, for that you can take anybody’s help so the desktop would not damage. Now check the overall installment and assembling, if found any error or loose nut bolts then make them perfectly screwed up and now it is the time to place your working stuff. In the final finishing touch, you need some prior holes for your pc installment and for charger points. Do some holes as needed for several wires and cords. Smooth all the rough edges and areas so that they won’t hurt or cause any damage in the future. For connecting many cables and cords, use the cord clips that are easily available at any super-store. These clips bound all the shattered wire and prevent them from hanging or cutting. If you have ordered the adjustable standing desk building kit from a branded place then you will get all these small and tiny tools and screws with that kit, so you need not find these elements from anywhere else. Now again check the adjustable desk lifting process and make sure that everything must be in proper harmony, now your sit-stand desk is fully assembled and ready for the work. We hope that these simple steps will definitely be going to help you. If you still found any imbalance or wrong instinct then watch the standing desk assembling videos that will teach you in much easier way. We have a huge look at all the easy or tough steps of building a standing desk. Even one thing you will surely agree that building a standing desk is not much tough as people take it. 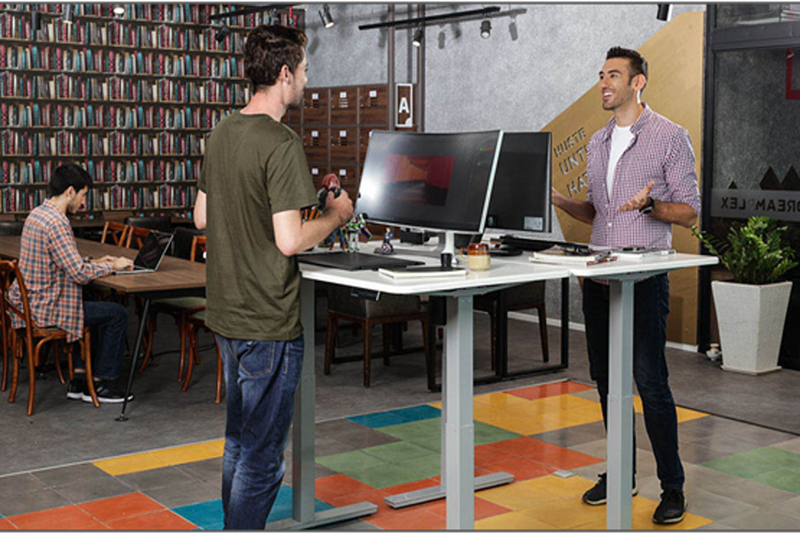 But again the question arises that why so many efforts of building or buying pre-build standing desk? Why is a standing desk important? Though there is no trend were popular in a previous age. People do their official work and never think about this side business. Well, we just want to inform you that in previous age people never faced so much anxiety or stress as well. They do work but not as much as workers are doing in a new era. Now there is much competition between companies for becoming number one, so they require high profile workers and employees for their company and also demand excess work for hours without caring their health and relaxation of their mind. Many significant studies revealed this heart-broken fact that the suicide growth is been raising day by day causes workload and other domestic troubles. Now you will think that how a standing desk relates to all these facts and data. Sitting for a long time can raise obesity and fatigue that is an indication of mind and body sickness. Obesity has been increasing day by day with a sedentary lifestyle. People have no time to rest, so the only solution that can change the whole phenomena and able to tackle the obesity issue is a standing desk. The researchers believe that when a person does the official work standing then he can lower the obesity level. For instance, an exercise has an ability to control the stress level but if you are standing for a certain time in a day then it can also influence your health positively. A healthy heart requires a healthy diet and some basic exercise; we are not talking about the heavy squats and steps. Prolonged sitting can make your heart’s health weak and decrease your metabolism that can cause a weak immune system as well. When you work standing then you have less risk of cardiovascular diseases. Also, you can burn your excess body fat via standing and your work also won’t interrupt. Sitting for much time can enhance anxiety, stress, headache and back pain. Many of us are not aware and they must be facing these all troubles. If you are doing sitting work and suddenly you stand up then continue your work then you will instantly see the difference. Stand up desks are considered as a new trend in the new world and they have changed many people’s life. If you are also tired of with your regular and boring life and your official work feels like a horror movie then choose a fine-quality adjustable standing desk. If you are a newbie then please visit www.autonomous.ai and this website will surely help you to fulfill your desires. Here you can buy all the necessary parts for building a standing desk. Also, you can choose a standing desk, chairs, adjustable stools and many other items.